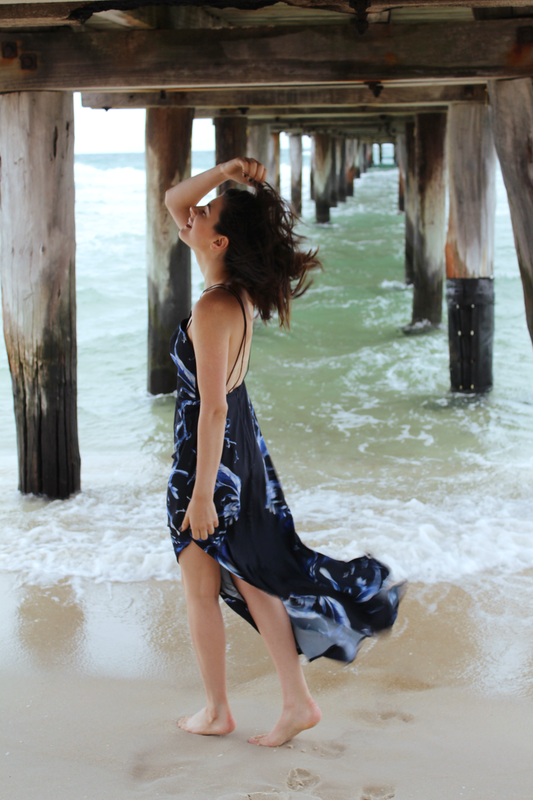 This Keepsake dress certainly doesn't need anything else to help it shine, so instead of finding shoes, I found myself at the pier and just let it float around in the wind. High slits, thin intertwined straps and a low-back (which I'm usually unsure about) make for an ideal Summer maxi I've decided, so I've linked this dress along with a few similar ones for you to check out below. This morning's cool change brought about just the right amount of warmth with the breeze to keep me from getting sick (again) as well. I hope you all had a wonderful New Years. I had last minute plans for once, but it was also exciting thinking that next New Years I'll be watching the ball drop in New York City. Thoughts become things ;-) Welcome to 2015, aka the best year of our lives so far. Gorgeous dress! It is ideal for summer. Gorgeous dress and beautiful pics ! I love these pictures, they could be on a magazine! Nice dress and love the wind in your hair! You look amazing! The dress is simply fabulous and I love it. What a beautiful dress! Wonderful navy color and print! What a Gorgeous dress, the Pics are amazing! Wow, the pictures are a dream! Hi Ivana and thank you for your visit!!! I like very much this dress.... I adore you and your sense of fashion and style. Oooh I'm hoping to watch the ball drop next (this coming?) New Years too. Thoughts do become things so I'm putting that (and a bunch of other travel agendas) out there. BTW that dress was totally made to be used barefoot and fancy-free at the beach. wow this photoshoot is really beautiful! And i love that dress! You are gorgeous! THANK YOU - Let's hope they are one day! The wind definitely made it an adventure haha! Keepsake always think up good prints! Thank-you Kaley! I'm sure it would look just as stunning on you too beautiful! Thank you! Mum is quite the photographer haha. YES. YES. YES. That's the way. I'll see you at the ball drop this year then ;-) And I agree. I have no idea what shoes to wear with it should I wear it out haha. I mean I'm sure there's plenty, but frolicking in the water with it is too much fun..
beautiful photos, lovely dress! ah i need some sea and sun myself this australia day long weekend..